What a truly wonderful occasion! Sunday 12th October saw Little Houghton church packed with Eddie’s family and friends, Bishop John, Archdeacon Richard, the Rural Dean and parishioners from across the benefice as we welcomed Eddie Smith as our new Rector. During the service, which involved being handed the church keys and ringing the church bell (8 times! ), he was welcomed by various groups including church youngsters, Sea Scouts, Guides and representatives from all the parishes. In the village hall afterwards his wife Jenny was presented with a bouquet and Eddie a buttonhole – a single red carnation. It was certainly a wonderful celebration to mark the next chapter of our benefice and we are sure you all will join us in wishing Eddie and his family many happy years among us. The photo above shows Tim Allebone (Deanery Lay Chairman) Rev. Eddie, Ven. 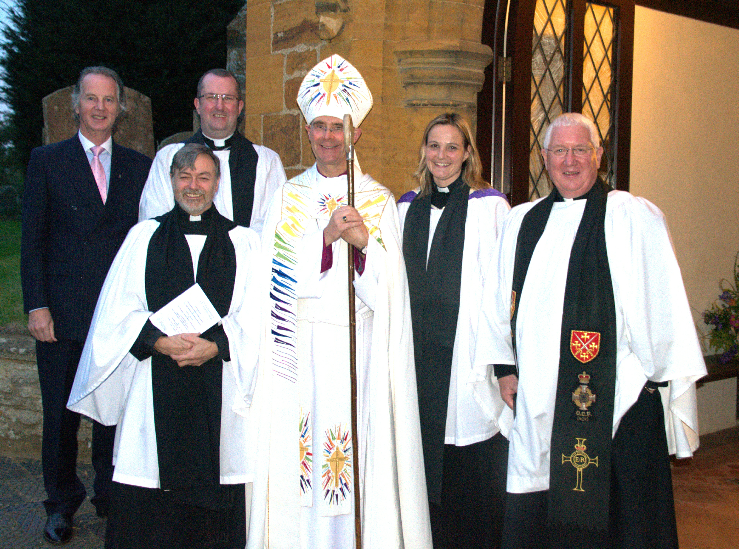 Richard Ormston (Archdeacon of Northampton), Rt Rev John Holbrook (Bishop of Brixworth) Rev Catherine and Rev Tony Lynett (Rural Dean).